The appeal of this beach lies almost entirely in its location, on the northwest of the Bukit peninsula, facing west into the Indian ocean. For one, it is out of sight, which means even tourists nearby sometimes don’t know it exists. It’s not even that heavily advertised. That makes it a hidden gem of an attraction. For the best views find the carpark near Pura Tegal Wangi, that would be hidden behind a wall. The panoramas from there are breathtaking, especially during the time from 6pm-7pm known as the Blue Hour. Photographers have long used the the wild and untouched looking beach as location for wedding photoshoots. Make sure you're not blown off the cliff edge during high winds. Also, the water here is not safe for swimming. Take a bus, taxi, bemo or ojek to here. 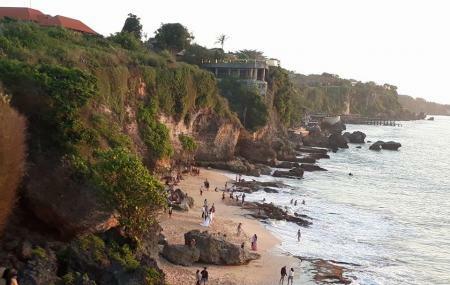 How popular is Tegal Wangi Beach? People normally club together Setia Darma House Of Mask And Puppets and Lovina Beach while planning their visit to Tegal Wangi Beach. Another beautiful rocky beach in the south of Bali. The place has not been touristic, so it is kind of solitary. Cars can reach a temple, then you need to walk a wide wild ridge. From the top of the ridge, there is a trail to the beach. Nice view to take photographs. This place is just gorgeous. Please note: swimming is NOT PERMITTED as it is too dangerous. Also, you will need to be physically able to go down all of the rocky steps if you want to get down below. You don’t have to... you certainly can just park your car and take photos from above. Definitely worth a quick little visit. It wouldn’t be the greatest for an extended day unless you pack your own waters and snacks. There are no facilities for purchases and no toilets/bathrooms. Beautiful beach with some great waves! No swimming here as the current is strong. The beach doesn't see too many people by beach standards as it's on an off-beat track. Offers some great picture postcard like moments to be captured on it with its turquoise coloured waters, sea weed on the beach and some great cliffs at the backdrop! Must visit if you're looking for a good beach to relax on. The best place to enjoy sunset in bali. But you have to bring your own food&beer. Because there's no restaurant.